Demant employs a two-tier management structure, consisting of the Board of Directors and Executive Management. The Board of Directors supervises the performance of the company, its management and organisation on behalf of the shareholders. It also contributes to determining the company strategy. The Executive Board, in turn, is responsible for the company's daily operations. The Executive Board consists of two members: Søren Nielsen, President & CEO, who is also President of Oticon A/S, and René Schneider, Chief Financial Officer. The Board of Directors of Demant A/S has eight members: five elected by the shareholders at the general meeting and three members elected by employees in Demant's Danish companies. The Board members elected by the shareholders are elected for one year at a time and staff-elected Board members for four years at a time. The last staff election took place in January 2019 and will take effect after the annual general meeting in March 2019. The Board of Directors is responsible for the overall strategic management as well as the financial and managerial supervision of the company, and it currently evaluates the work of the Executive Board. The Board of Directors' duties and responsibilities are set out in its rules of procedure. These are revised once a year. Once a year, the Chairman of the Board evaluates the Board’s work. Every other year, such evaluation is performed through personal, individual interviews with the Board members by the Chairman of the Board, and every other year, the evaluation is carried out by means of questionnaires to be filled out by the Board members. In both instances, the results of the evaluation are discussed at the subsequent Board meeting. In connection with the evaluation in December 2018, the Board members expressed great satisfaction with the manner in which the Board works emphasising the constructive working climate in the Board where trust and openness are key elements. Though Board members are up for election every year, they traditionally sit on the Board for an extended number of years. This ensures consistency and maximum insight into the conditions prevailing within the company and within the industry. This is considered to be extremely important in terms of the value that the Board of Directors brings to the company. In fact, it is considered just as important as the professional skills listed above. The basic fee for a Board member is DKK 350,000. The Chairman’s fee is three times the basic fee and the Deputy Chairman’s fee is twice the basic fee. There is no separate fee for nomination and remuneration committee members. Audit committee members receive a fee of DKK 50,000. The Board adopted the Remuneration Policy at the Annual General Meeting held on 19 April 2019. In 2018, the Board of Directors convened on five occasions. Demant's Board of Directors has set up an audit committee, a nomination committee and a remuneration commitee. Read more about our work on corporate governance, which we consider an ongoing process up for regular assessment. 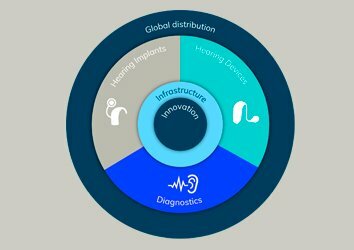 A unique position in the hearing healthcare market, based on true innovation and an efficient global set-up, we are equipped to help millions of people.